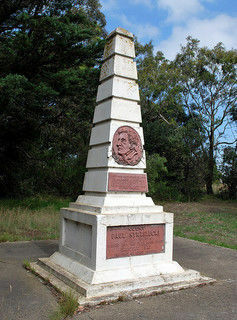 If we go out on the Princes Highway three miles on the way to Rosedale, we will find a monument on the right side of the road. Risking our lives in the pursuit of the next cache fix, we headed just out of Traralgon along the road to Rosedale, where we did battle with our fellow drivers who appeared to be competing in some sort of Bathurst-esque time trial. Timing it right when the rest of the cars must have been in the pit changing tyres and refuelling, I swung the geo-mobile around so we were on the inbound side of the road. I’ve driven past this monument so many times but never stopped to check it out. Actually, that’s probably the most appealing thing about some of the caches we’ve hunted down so far… they remind you to stop and really take in your surroundings. I like that. The time trials had started again so it took a little while before I was able to exit the geo-mobile without losing the door… or worse. Clambering up the side of the road to a safer vantage point, I had a quick read of the plaques plastered on the front of the monument. I quite like Count Strzelecki. In part because of his rather exotic sounding name, but also because of the doubt that still lingers to this day over any real legitimacy to call himself a Count, as well as his dedication to the woman he was never destined to be with. Back in 1820 he asked for the hand of Adyna Turno, the younger sister of a pupil Strzelecki had been tutoring. Adyna’s father rejected him as a suitor as he had plans for his daughter to marry »up« so as to get himself out of debt. I wonder if that’s why Strzelecki started using the title of Count not long after? As a bit of an »up yours« to Adyna’s father maybe? Either way Count Strzelecki kept himself extremely busy, travelling the world doing this great thing and that great thing, all the while exchanging letters spanning over 40 years with the woman he loved. 20 years into their letter writing, they were still speaking of marriage. Though their lives were worlds apart they were always thinking of each other – after conquering and naming Mt Kosciuszko, Strzelecki picked a single white mountain daisy and enclosed it within the folded pages of his next letter to Adyna (say it with me girls… » awwww «). Their wedding never eventuated, but nor did either marry another. Only four of their letters still exist today out of more than a hundred written, and within these surviving letters their affection for each other was clear. You won’t get that story on the plaque, but you will get the opportunity to hunt for the cache. Afterall, that’s what we were here for! Taking a slow look around I quickly spotted something out of the ordinary, whilst geo-daughter was busy disturbing some ants and spiders at the base of a tree. Without moving, I quietly told her she was looking in the wrong spot. Standing up, geo-daughter saw what I had been looking at, and together we headed over to make the find. Yes, together. Not like back at the Cross Cache. This cache was also stuffed full of swaps, and… wait… what’s this? There’s a cool looking coin-shaped thing in a bag. Could it be? I’d only been reading something about Geo-coins the night before. Had we found one? Panic ran through me as I realised I had no idea what to do with it. Do we take it? How do we log it? What if I mess it up for someone? Geo-daughter had already signed the log and done the swap and was hurrying me along. I decided to take a pic of the coin and see what I could find out about how it all works. I later discovered later that it was actually a Pathtag, and not a Geo-coin. That means we could have just taken it, logged that we’d found it, and that would be that. If we’d had more time the little bit of paper that was with it PROBABLY EXPLAINED ALL THIS! It was later that evening that I decided I would collect Pathtags. I don’t actually have any yet, but I’m collecting them.